Some of the world�s leading pharmaceutical companies are reaping billions of dollars in extra revenue amid global concern about the spread of swine flu. Analysts expect to see a boost in sales from GlaxoSmithKline, Roche and Sanofi-Aventis when the companies report first-half earnings lifted by government contracts for flu vaccines and antiviral medicines. The fresh sales � on top of strong results from Novartis of Switzerland and Baxter of the US, which both also produce vaccines � come as the latest tallies show that more than 740 people have died from the H1N1 virus, and millions have been affected around the world. GlaxoSmithKline of the UK confirmed it had sold 150m doses of a pandemic flu vaccine � equivalent to its normal sales of seasonal flu vaccine � to countries including the UK, the US, France and Belgium, and was gearing up to boost production. GSK also produces Relenza, an antiviral medicine that reduces the length and severity of the infection, and is preparing to increase manufacturing towards 60m annual doses. The UK placed an order for 10m treatments this year. One beneficiary of the fears about the pandemic has been Roche of Switzerland, which sells Tamiflu, the leading antiviral drug, and has seen a sharp rise in orders from private companies as well as governments. A report last week from JPMorgan, the investment bank, estimated that governments had ordered nearly 600m doses of pandemic vaccine and adjuvant � a chemical that boosts its efficacy � worth $4.3bn (�3bn, �2.6bn) in sales, and there was potential for 342m more doses worth $2.6bn. It forecast that fresh antiviral sales could boost sales for GSK and Roche by another $1.8bn in the developed world, and potentially up to $1.2bn from the developing world. But there were also uncertainties for the pharmaceutical manufacturers. With demand likely to outstrip supply, and initial production suggesting that the yield for the pandemic vaccine is relatively low, they may face difficult choices in determining how much to supply to the countries seeking orders. They are also under pressure to provide more drugs and vaccines for free, or extremely cheaply, to the developing world. What an anti-swine flu vaccine being used to make HUGE profits at the expense of human life? Say it isn't so... The price of the vaccine in the "developing" countries will be paid for by the usual group of countries that pay to ship in food and other goods that rarely reach the people, but are used as bargaining chips by the so called leaders of these countries. Yes, this flu is spreading, last report claims over a million in the US alone and yet...not really much talk about it on the news (entertainment) channels. Not much in the way of warnings on how to help prevent the spread of this either...like washing hands, wearing gloves and masks, being sure that children with symptoms be quarantined from school and other children. Nope that's a simple and inexpensive way to help control the spread of anything, after all we are Americans and can always just take a shot. Over a million and so far reported as having symptoms but not much information on the number of deaths related to contracting this flu. If indeed this is the second generation (or third) of the Spanish flu from 1918 then it would seem it's getting weaker and not stronger. With the exception of the war bring people from other countries closer together in 1918, normally during that time few people had access to international travel, not so today. Therefore, if this is the same disease one would expect it to be spreading faster and causing far more illness and death. I have my doubts about this vaccine. Thank you Raffi. This is great business for everyone mentioned! Join Jane Burgermeister in her fight against the who! I'm not surprised. Obviously the situation will be very profitable for some and the "scare" will make it more so. Me, I plan to have a real talk with my doctor In September about the vaccination; as a teacher I see dozens of people every day in my job, people who also meet lots of people. For the moment I have always managed without extra precautions other than normal hygiene, to avoid bad colds, flu, and gastro but I don't think I want to fool with this H1N1 because it seems very contagious, so I want to be informed. Have to see how it goes. Thanks Raffi. This disgusts me. Thanks Raffi. I fear for my son in the Navy because they live in such cramped quarters on a ship. Obviously, if a huge ship like the USS Boxer can have the problem, a small ship like he one my son is on will have it worse. 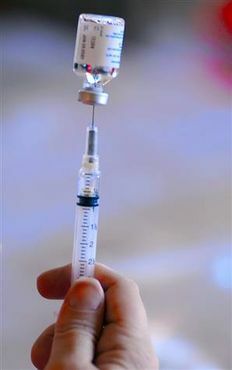 I friend of mine from England, said they are forbidden to travel abroad there because of this flu. I am going to take it seriously an get the vaccine. People tend to forget polio and smallpox both of which have been wiped off the face of the earth because of vaccines. Vaccines work and all the paranoia is misplaced. If the drug companies can keep up with this flu and its incredible ability to mutate, in the case, they deserve the profits. I am against the vaccine. I will take my chances. They use chicken eggs to develop these vaccines! No way! Is anyone really surprised by this news? You'll have to copy/paste the above link, then, look for the Blue "my first swine flu alert" link, for an overview of reality on this. it figuers the worold is on the verg of falling into a global pandemic,and still that's all these greedy prick's can think about is money,know wounder the worold is in such sad shape,when you have people like this running the show is there ever going to be a recovery. These rich are getting richer, whilst praying on the vunerable, in scaring them into this swine flu pandemic which is not a pandenmic... lets wake up and smell the coffee and not fall prey to their scare tactics... It makes me sick in how they are always looking for a quick buck... About time they made some medications free.